Hawaii Gov. 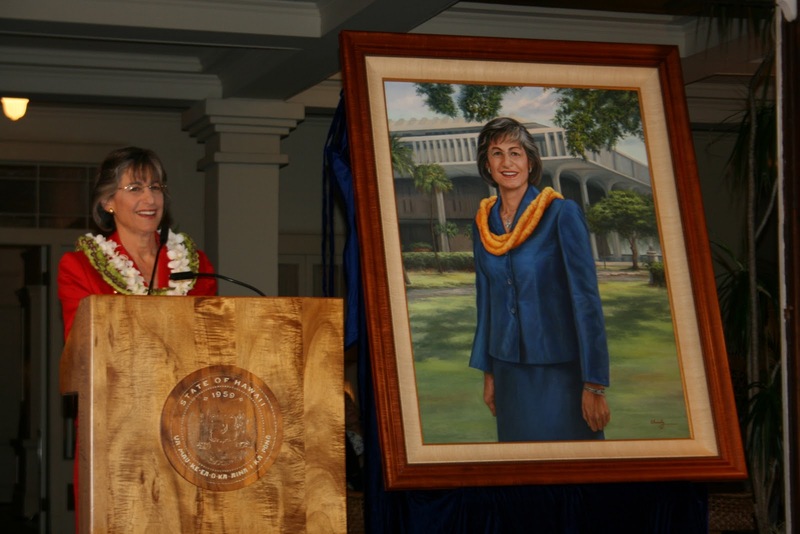 Linda Lingle's official state portrait shows her standing in front of the Capitol building, smiling and wearing a blue suit and a yellow lei. Associated Press. Citigroup Inc. will repay all the money Hawaii lost on $1.1 billion worth of investments in student loan-backed securities, according to a settlement announced Tuesday. Associated Press. Lt. Gov. James "Duke" Aiona said yesterday that he will decide after the 2012 elections whether to run for governor again in 2014. Star-Advertiser. It's been three weeks since James "Duke" Aiona lost to Neil Abercrombie in the governor's race. KHON2. Duke Aiona is proud of his career, saying not too many people can claim as many public service jobs. Hawaii News Now. James "Duke" Aiona says he'll be back — maybe. Associated Press. Defeated GOP gubernatorial candidate Duke Aiona said Tuesday he is eying another bid for governor in 2014. KITV4. Experts: Hawaii not involved in Korea dispute. KHON2. The escalating tension between North and South Korea is being closely monitored by Hawaii's visitor industry. Hawaii News Now. An international terrorism expert says Hawaii officials will need strong leadership and to work close with the community to keep next year's Asia-Pacific Economic Cooperation meeting safe. Associated Press. Carlisle Says City Won't "Tolerate" Homelessness During APEC. Civil Beat. The Hawaii chapter of the American Civil Liberties Union is planning to distribute flyers to airline passengers explaining their rights at airport security checkpoints. Associated Press. A 74 year old Maui grandmother is among a growing number of Americans speaking out against new security procedures at our nation's airports instituted by the Transportation Security Administration. KHON2. Donald G. Horner, chairman and chief executive officer of First Hawaiian Bank, has been named chairman of the board of directors for the Hawaii Visitors and Convention Bureau (HVCB) for 2011. Hawaii Reporter. Haleakala Ranch Cattle Manager Greg Friel hopes for La Nina to develop in the eastern Pacific next year. Maui News. A native Hawaiian practices organization is suing the University of Hawaii and the state to require an environmental impact statement on the proposed management plan for a Haleakala observatory on Maui. Star-Advertiser. The battle between a traditional poi maker and the state Department of Health has escalated, with supporters of the traditional practice using a petition and even bumper stickers calling for the state to allow hand-pounded poi to be sold commercially. KITV4. It will cost 13 cents more to ship a 20 lb. bag of rice to Hawaii after new Matson container shipping rates go into effect in January. Hawaii News Now. The City Council, with five new members coming on board next year -- including one who has yet to be elected -- has organized behind Nestor Garcia as Council chairman for 2011. Star-Advertiser. KITV4 News has learned City Parks Director Lester Chang is resigning, upset about what he considers to be a “lack of support” from the new administration of Mayor Peter Carlisle.KITV4. The county Planning Commission officially accepted the resignation of Planning Director Ian Costa during its regular meeting Tuesday at the Mo‘ikeha Building. Garden Island. University of Hawaii professor Christopher J. Bae is being awarded a $1.1 million grant to research eastern Asian human evolution during prehistory. Associated Press. Two small earthquakes struck within 20 minutes and 50 miles of each other last night off the coast of Maui, shaking residents as far away as Kapolei. Star-Advertiser. An earthquake rattled Maui County residents at 6:34 p.m. Tuesday. Maui News. This year, Honolulu police are on pace to exceed the number of DUI arrests they made in 2009. Hawaii News Now. The Big Island continues to lag behind the rest of the state in its gradual economic recovery. Tribune-Herald. Patients at North Hawaii Community Hospital are more satisfied with their care than those at Kona Community Hospital, and both are much more satisfied than patients at Hilo Medical Center. West Hawaii Today. A new, more environmentally friendly VA clinic opened Monday morning in Lihu‘e, offering bigger lab facilities and more exam rooms and offices. Garden Island. Before the 40-foot Monterey Cypress could be felled Monday morning, master woodworker Ski Kwiatkowski talked to it, shared the plan and asked the tree's permission. West Hawaii Today. Several improvements to the Kaunakakai Harbor have been in the works, and the state Department of Land and Natural Resources (DLNR), in coordination with the Department of Transportation, invites the public to attend an information meeting regarding its proposed Maui to Molokai ferry system improvements project for the Kaunakakai Harbor. Molokai Dispatch.